Worst. Disguise. Ever! | hesaidwhatnow? James Coldwell had a spur of the moment idea to rob a bank in New Hampshire, USA. Sadly, his disguise reflected this lack of preparation. Customers were confused as they saw a man walk into the bank dressed like a tree. Yes, Coldwell decided that having twigs and leaves duct taped onto his body was a perfectly sensible disguise. Surprisingly only to Coldwell himself, his ‘disguise’ actually drew more attention to him, giving the bank even more time to prepare themselves for the attempted robbery. When the dye pack in the bag of cash he was given detonated, Coldwell fled the, ahem, branch empty handed, leaving a forest trail behind him. When his picture was shown on television, a tip led the police to Coldwell’s apartment where a search of his car revealed some leaves and a roll of duct tape. The police were unable to locate his brain. Equally as pathetic a disguise was the one used by 51-year-old Sharon Lain of Oklahoma, USA. Lain robbed a McDonald’s restaurant as she was unemployed and desperate for money, as evidenced by her makeshift mask – a pair of underwear. Although the white stretch girdle known as ‘spanx’ wrapped around her face hid her identity, it was all for nothing. 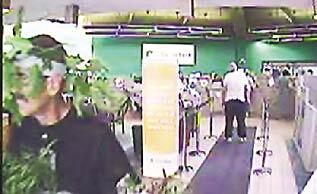 Surveillance video of the robbery was shown on television, leading to several tips that resulted in Lain’s arrest. Disturbingly, this means that several people watched the video footage and recognised Lain’s underwear. Police searched her apartment and found the offending pair of spanx, presumably not on her head. Probably worse than the above was this effort by Iowa men Matthew McNelly and Joey Miller. 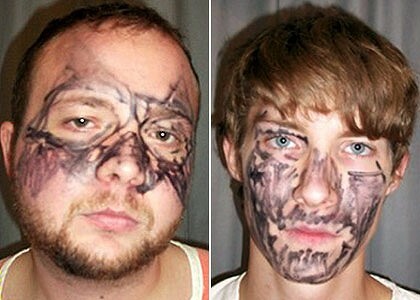 The pair attempted to break into an apartment, but not before disguising themselves by drawing on their faces with marker pens. It’s unclear whether or not the duo were sniffing the markers beforehand, but their efforts – which were unfinished – not only didn’t even come close to disguising themselves, but actually made them easier to identify. In other words, the pens marked their identity. Fingers crossed there’ll be a sequel to The Usual Suspects where another team of crooks team up after meeting in a police line up – wearing twigs, underwear, and marker pen disguises. I’d watch that.